In the summer of 2015 I walked the Pennine Way completing the whole route in fifteen days and at the end of the walk, as I sat on the train returning south from Berwick-upon-Tweed, I wondered what challenge could compare with what for me, had been a superb trail. In 2000, I had attempted to walk the Cape Wrath Trail with a friend but illness had forced me to pull out after four days at Shiel Bridge and the walk had, in the intervening years, lurked in the back of my mind as unfinished business. I glanced out of the train window at the Cheviot Hills, now bathed sunlight and smiled ironically as I recalled the previous day’s ten and a half hour battle over these remote hills in atrocious conditions as I had made my way to Kirk Yetholm from Byrness and I toyed with the idea of returning to Fort William to re-start the walk to Cape Wrath. The intervening gap of sixteen years made my first attempt seemed too distant to consider resuming the walk from Shiel Bridge, and as I pondered this , I recalled the sign on the wall of the Border Hotel at Kirk Yetholm for the newly inaugurated Scottish National Trail and hit on the idea of continuing the walk from the end of the Pennine Way at Kirk Yetholm to ultimately reach Cape Wrath. I became quietly excited in anticipation at what seemed to be a mammoth walk and once I had returned home, spent the following months buying maps and guidebooks and planning for my walk. Although I decided I would use the Scottish National Trail as the ‘template’ for the walk, I wanted to vary it to suit my purposes and I made two significant alterations. Firstly, I decided I didn’t want to visit Edinburgh as I had visited the city in the past and when I am walking alone, I find large cities fairly alienating. Secondly, the Scottish National Trail, after a short distance following the West Highland Way, heads east in a large loop through the Loch Lomond & Trossachs and the Cairgorms National Parks. I decided that I would forgo this loop and instead head straight up the West Highland Way to Fort William. I had never walked the route before and I felt it was also a route that my wife would enjoy so she could meet up with me at Milngavie and we would walk together to Fort William. During my planning, I envisaged camping for the first part of the walk until I reached the Union Canal near Broxburn, from where I intended using hotels and guesthouses. As my wife does not camp, we booked accommodation in advance for the whole of the West Highland Way. From Fort William, I would then carry on alone following the Cape Wrath Trail where I would use my tent, as well as any accommodation along the way when the situation demanded. For this section, I had no schedule and although ideally I wanted to complete the whole route in one, I was aware that this trail would be totally different to the previous sections of the walk and I adopted a ‘let it play itself out’ approach. In 2000, my friend and I had used the ‘North to the Cape’ guidebook by Denis Brook and Phil Hinchliffe and I intended using this again, particularly for the section to Shiel Bridge as I was keen to replicate our trip from sixteen year earlier. I also purchased the new ‘Walking the Cape Wrath Trail’ guidebook by Iain Harper along with the Harvey’s strip maps for the walk. After much planning, I decided to start my walk on May 10th 2016 and it was with a sense of anticipation mixed with apprehension that I travelled up to Berwick Upon Tweed the day before to resume my march north. 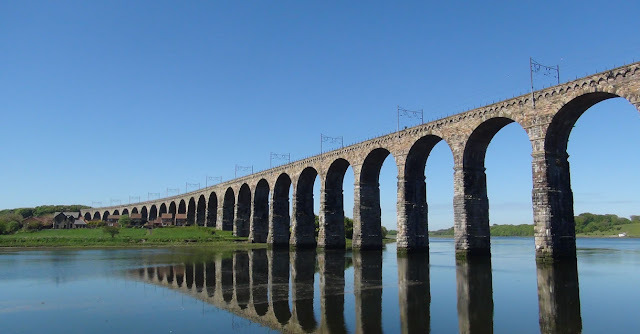 Upon arrival in Berwick, I had an hour or so to spare before my connecting bus to Kelso and as the weather was beautifully sunny, albeit accompanied by a cold wind, I spent the time walking along the riverside path on the banks of the Tweed to admire the Royal Border rail bridge. This multi-arched span across the river looked splendid in the bright afternoon sunshine, as I mingled among afternoon the strollers feeling conspicuous with my backpack . Soon, my bus arrived and it wasn't long before I was settled into my bed and breakfast room for the night and reading my maps and guidebooks for what was to be the longest walk I had ever undertaken. This walk is essentially my version of the Scottish National Trail and each section is subtitled (SNT) followed by the number of the section.